My first good day of chasing in New Mexico in 14 years of storm chasing, and the first time I’ve been in southeastern New Mexico. We started the morning in Amarillo under torrential rain from the storms that had been continuing overnight. The flash flooding on the frontage roads of I-40 was amazing! Once we navigated our way through that, we headed southwest through Clovis, NM to Roswell, where we stopped for lunch and shopping at the tacky UFO shops. Our target was the area east of the Capitan Mountains where an outflow boundary from the previous day’s storms intersected the oncoming warm front. There were already storms forming in the mountains, but we had to wait for them to develop and come off the hills. After lunch, we decided to reposition to Artesia to the south. Things were still progressing slowly, but we had our eyes on two cells well off to the southwest over the Guadalupe Mountains. With plenty of time to kill, we headed west towards Hope, NM and stopped at a rest area as the storms pulsed up and down. After about 45 minutes, the cells we were observing, which had looked like they were dying about 30 minutes earlier, suddenly took off and the chase was on! We headed south on County Road 12 and soon were in the middle of nowhere on the New Mexican plains northwest of Carlsbad. We found a good vantage and watched the development of the supercell to our west for a good 45 minutes. By this time there were additional cells blowing up around us, including a left moving supercell to the south across the Texas border that was tornado warned and heading towards us. While it looked like that cell was being interfered with by other cells, we wanted to get into a position to intercept it if we chose, and to do that we had to get south and east quickly in order to avoid the core of the storm we’d been watching as it was just about to cross the road. Unfortunately, it turned out our road option quickly became unpaved! It was called Rock Daisy Road, and while I didn’t see any daisies, it was basically made of rocks, and we were now 18 miles from pavement with big hail following right behind us! We were mostly able to stay out of the hail, but the road was horrible and I was worried about blowing a tire, not to mention that the dirt being kicked up by the other vehicles reduced visibility to near zero! We eventually got well clear of the storm and parked the vans at an oil collection tank (this is really oil and gas country, with wells everywhere and the whole area for miles reeks of oil and signs that say “If you smell H2S, leave the area immediately!”, as if I knew what H2S smells like! We watched the storms from this vantage for a while but soon we had quarter sized hail dropping around us and it was time to get back in the vans and out to the pavement. We headed south on 285 towards Carlsbad then southwest on Rt. 137, stopping to watch the second storm behind the one we originally chased as it came towards us and intensified. Meanwhile, the tornado warned storm from the south was also clearly visible, having plowed through a bunch of smaller cells and survived. The structure of the storm to our west was fantastic! It had that spinning soda can look, and as the Sun set, was backlit nicely. We watched that storm for another 30 minutes before the storms to the south began to interfere with it and it started to deteriorate, and with 3 hours to the hotel in Lubbock, it was time to go. As we stopped in Artesia to grab dinner before the long ride, we did get a nice mammatus display from the cluster of cells that the formerly tornado warned cells had become. We then drove to Lubbock with a nice lightning show going on around us, finally getting to the hotel around midnight. 518 miles for the day. 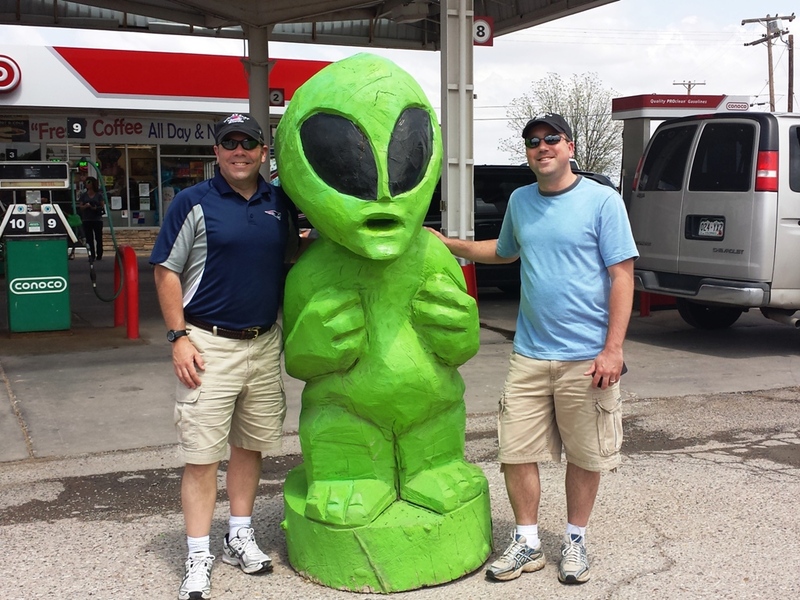 Brad and I made a friend in Roswell! Storms formed in the mountains to our southwest. Mammatus field on the anvil of one of the storms. We headed out into the scrublands south of Hope. Nothing but us and the storms. Here, a big "beaver tail" inflow band on our storm. Our storm with a little of the local flora in the foreground. Nice looking storm made it out of the mountains headed our way. The SLT fleet waiting for the storm. Just to our west, scud being ingested into the storm. We were right under a big inflow band as the hail core started to close in on us. Pretty soon it was time to run, but we waited a little too long and had to scramble out of there! We finally got to a decent road and pulled away from the hail core. All you could smell was oil and gas now that we were in the gas fields. It was horrible! 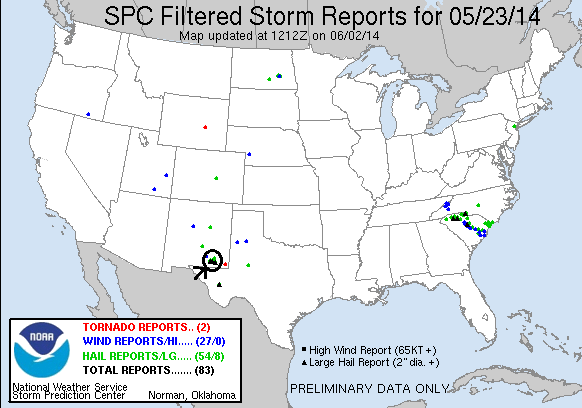 Meanwhile to our south there was a tornado warned storm coming out of west Texas. ..and our storm was developing a wall cloud in the distance. Now just north of Carlsbad, we've got a legit supercell on our hands! Eventually quarter-sized hail started to land all around us. Time to get moving again! Photo by Karen Cooksey. Meanwhile, here comes that tornado-warned cell from the south. Our storm looked better on radar though so we stuck with ours. Great structure and rotation! Yet another great sunset storm shot! We had some great photo-ops on this tour. Nice rain-free base and striations. Back to the storms. The formerly tornado warned storm from the south shriveled up just east of us. Our storm was seeded by the storm to the south and weakened but still had this cool mammatus field as we stopped in Artesia to grab dinner.